The Cincinnati Zoo says its premature baby hippo, Fiona, is getting more independent and now tops 100 pounds. 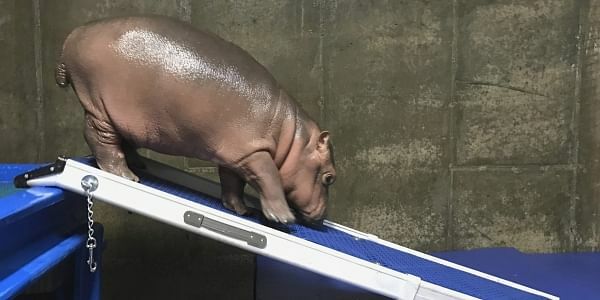 CINCINNATI: The Cincinnati Zoo says its premature baby hippo, Fiona, is getting more independent and now tops 100 pounds (45.36 kilograms), meaning her days of napping on her human caretakers' laps are dwindling. She was born at the zoo in January and weighed just 29 pounds, far below the typical weight. The zoo says caretakers raising Fiona are beginning to scale back their time with her, leaving her alone for a few hours at night. It's the beginning of a transition in how much contact they have as they move toward eventually integrating her into a group of hippos with her parents. They say hippos can grow to be 3,000 pounds and are very dangerous, so at some point caretakers will begin interacting with her only from behind a protective barrier.